Whether for use as an awning, barbeque area, umbrella, tiki bar, or thatch wall covering, Sunset Bamboo™ offers commercial grade Tahitian thatch in a variety of products that give you vast flexibility to create mood and feel anywhere you need it and a variety of complimentary thatch products that contribute to the décor in any manner that works for your space, and all with the unique ability to withstand sun, rain and wind while offering great insulation qualities. When installing Tahitian Thatch panels you would need to overlap a minimum of 8" would be needed when installing multiple rows of Tahitian panels on most roofs, this will give you about 2.5 sqft of coverage per panel. 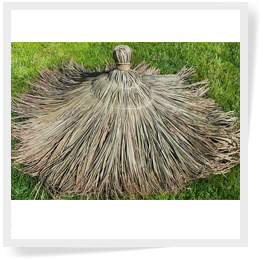 Our Tahitian Thatch top cones are great for round roofs or 4 sided hip roofs that come to a point, this will be the final piece that you will install on the top of your roof. 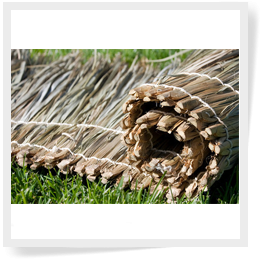 We offer treated Tahitian thatch panels with class A fire retardant for customers that are installing at a business location or that live in a HOA community whether using the thatch rolls inside or outside that will require a fire marshal inspections. 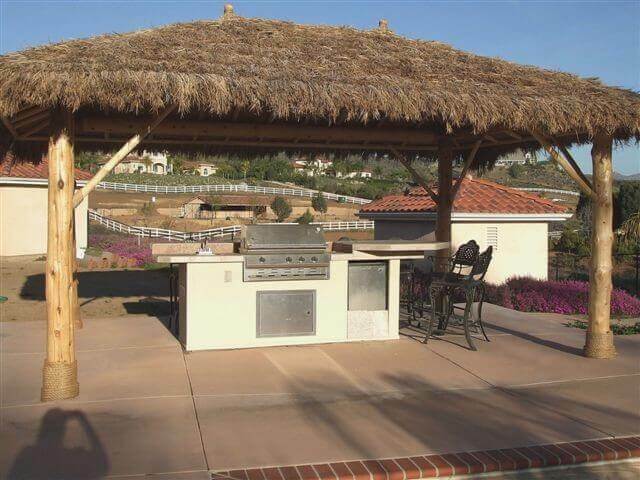 Fire retardant is also great for customers that have a palapa structure that is close to a house, BBQ grill underneath their structure, wood burning fire pit or forth of July type holidays. This will definitely give you a piece of mind during the hot summer months. Learn how to quickly calculated the amount of thatch needed. Learn how to build a tiki hut or tiki bar with our easy DIY intructions. Tahitian thatch AKA Fiji thatch is a popular material for roofing and other outdoor structures. It is a thatch carefully woven from dried palm leaves and secured with nylon string for maximum durability. The life expectancy of the Tahitian thatch is longer compared to other thatches at 10 to 12 years. It is commonly used among many resorts, water parks, and cabanas. Tahitian thatch is an ideal product for both residential and commercial applications. It can be used to create a fabulous tropical and luxurious atmosphere wherever you desire. These particular thatch panels are exceptionally durable and can withstand severe weather conditions with proper maintenance and treatment. Tahitian thatch has an increasing popularity for the use in roofing applications for bar tops, tiki huts and bars, and sun huts. You can also use it for more outdoor purposes like waterpark decor, poolside cabanas and beachfront resort features. More uses for Tahitian thatch products are as follows: for shade umbrellas, custom roof structures, and indoor or outdoor tropical themed weddings or settings. Tahitian palm thatch is harvested from palm groves and is considered to be a sustainable product because only the leaves and branches are harvested from the trees and the rest of the plant is left alone to continue growing. Other wood resources require you to kill the entire plant when they are being harvested. There are also no harsh chemical or pesticides used to create this type of thatching. Because it is so natural, each piece remains in its own natural and beautiful unique state. We carry our Tahitian thatch in a 3ft. x 2ft. thatch panel and a 36” thatch top. Our Tahitian thatch includes longevity of up to 10-12 years that features fire retardant material perfect for your tiki bar. Any structure you create will last for years to come and can be purchased today with no shipping charges.